After so much time focusing on the challenges of postwar contested return, it was quite uplifting to learn more about how ambitious and innovative some returnee-led businesses have become. But most of all, it demonstrated the importance of promjena svijesti (changing mindsets) as a vehicle for the kind of social and political transformation that is needed to create modern institutions and a functioning state in the long-term. In Bosnia, systemic corruption is the norm, which is not surprising given centuries of colonial Ottoman rule followed by communism, war and then a post-war dependence on aid and international institutions. The old communist nomenclatura system of party patronage and state monopolies has passed into the hands of agents of a modern form of corruption: nationalist political elites, their family relatives and war comrades. Both systems tend to put state resources in the hands of political elites that see themselves as the embodiment of national destiny, resulting in a blurring of lines between personal and official interests, and supported by reference to the perceived dangers posed by internal and external enemies, which is reinforced by control of the media and education system. Curbing corruption that is deeply ingrained in all aspects of social structures rather than just being an exception (individual cases) is a slow and challenging process. As North points out in his Nobel Prize talk, rules may be changed overnight, but the informal norms usually only change gradually – and thee, not rules, are what governs behaviour. There is also the classic game theory problem – if everyone assumes others are corrupt, they are less likely to behave correctly themselves, as to do so would be to lose out without any prospect of changing the norm. corruption actually means “particularism”—a mode of social organization characterized by the regular distribution of public goods on a nonuniversalistic basis that mirrors the vicious distribution of power within such societies. …their [people’s] treatment depends on their status or position in society, and people do not even expect to be treated fairly by the state; what they expect is similar treatment to everybody with the same status. This phenomenon is problematic, but in a situation of contested return such as Kozarac, its impact can be even greater because the authorities are broadly hostile to the returnee minority and ready to use official Republic Srpska institutions against them. Therefore joining in with local corruption presents risks, but so too can any attempt to resist it and refuse to ‘play along’. One of the defining characteristics of the Kozarac return story has been the need for self-reliance. In the early years, this was played out in fighting for return, re-establishing the local community and standing up for political rights and memorialisation. Increasingly today, the priority is economic self-reliance if the community is to reverse the slow drift of young people away from the area in pursuit of a future for themselves and their families. On my recent trip, I visited two local businesses that are remarkable both for their ambition to create internationally-competitive products, but also for the way that they handle the ever-present challenge of corruption, quality standards and other aspects of the prevailing ‘mindset’ that they believe needs to change. These two firms, Arifagic Investment and Austronet, are both led by members of the returnee community who are motivated to create a sustainable local legacy, rather than just to create short-term profits. Their work employs a curious mix of path dependence – knowledge of how and why things are the way they are – and also new thinking in the Bosnian context. They are aware that history matters, and here I do not mean only recent war losses and terrible experiences, but a long intergenerational heritage of economic models that created the country’s political culture. And yet, their life experiences and exile exposed them to new forms of learning and knowledge necessary to combat a “stuck” society such as Bosnia. They also draw upon their experience of doing business in Norway and Austria respectively to inform their belief that only by upholding the highest standards of quality and ethics can they avoid being dragged down by local norms. They not only refuse to take part in customary corrupt practices, they also understand that to do so requires them to be scrupulously ‘clean’ as any compromise on this point would leave them vulnerable. Therefore, although it is not perhaps their primary goal, both firms are pioneers that are changing the local mindset and demonstrating that even in Bosnia, and specifically in Republika Srspka, it is possible to create internationally-successful businesses. In some way, these firms represent a much needed philosophy of abandoning what we know and embracing new learning practices and behaviours in the pursuit of radical change of a value system that influences both formal and informal institutions. The cornerstone of this is building a culture that goes beyond the self-interest of a leader. But how to articulate let alone achieve this in a community that often sees personal success as a threat or assumes it derives from some form of corrupt behaviour? Social trust is in short supply regardless which ethnic or social group one may belong to. 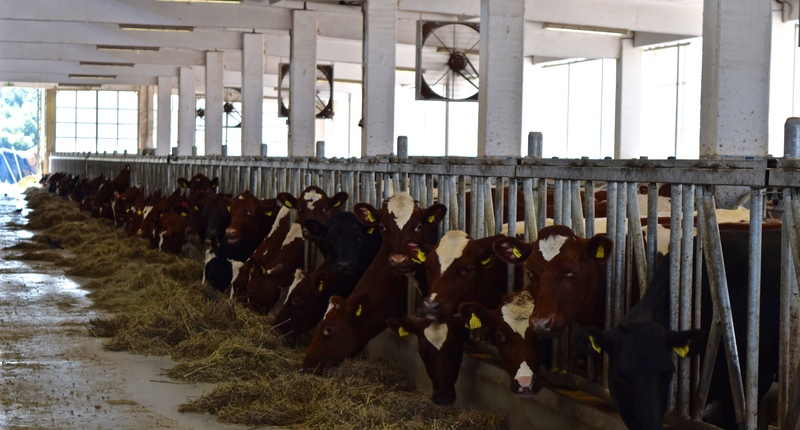 Jusuf Arifagic returned to Bosnia from Norway a few years ago with a significant personal investment and several hundred Norwegian cows of a special breed. He bought a plot of land in Trnopolje not far from the site of the camp where he and his family were interned during the war, and established Arifagic Investment as an agricultural business with visionary and innovative strategies for the future of Bosnian farming, meat production and biogas generation. He also planned to improve the education and training of young people through plans to build a secondary school with Norwegian standards of education, which could also provide additional training in Norway. I met Jusuf last week and was impressed by his humility and vision, and his realisation that he needs to lead by example as a way to influence his workers and the local community. He employs young professionals who despite being smart are not above working in the stables, and needless to say, ethnicity doesn’t count here – just a willingness to work hard, an eagerness to learn and strong personal ethics. For example, one young returnee, a law graduate, could not find a job despite being a star pupil in RS, so he became a shepherd to support his old parents. Upon reading about him in the newspaper, Jusuf called him and after a ten minute interview, gave him a job. I returned to create something larger than my life, to leave it behind for my children and the coming generations to work on. I can only create the right conditions for the new ways of thinking to emerge, and work ethics, so that the society may focus on a better future devoid of corruption and wars. While I was at the farm, an inspector arrived. He instructed his young lawyer to show him around, explaining to me that he receives many visits by various inspectors but does not want to deal with them personally, as many expect a bribe. He mentions in passing that regional politicians have tried to lure him into politics to bring him ‘on side’, but he is adamant he will not be joining them. He asked me if I have installed the fire sprinkler system with pipes’ at least 8mm in diameter around my warehouses. I said, if the regulations require it, then, yes. He then said: “oh don’t worry most people install pipes of 6mm, because the 8mm versions are very expensive. So I am sure you have not installed the 8mm one…but do not worry.“ I assured him that if the law requires 8mm pipes, then that is what we have, and told him he can view our technical drawings. Kahrimanovic then remembered that there was a place in the building where the pipes are visible, so he measured them. They turned out to be 10mm wide. The point of this story was to illustrate how inspections are often performed informally, as though an inspector is doing you a favour and you ought to compensate him because it is expected behaviour to bend the rules. The entrenched belief system that “everybody is corrupt, so why shouldn’t I or you be” is difficult to change in a political culture that has no incentive to tackle it. Mutual expectations that everyone is going to cheat eventually are particularly hard to grapple with in a postwar context. But as part of building a better future for the re-established community in Kozarac, these two businesses are examples of why it matters to do things differently. Informal, personal modes of exchange that grant access to familial, socially or politically related individuals rather than universal, impersonal access based on merit is the dominant approach in Bosnia today. But to create sustainable businesses and institutions requires a more impersonal approach based on equality under the law, and in the absence of a healthy state that can create such an environment, perhaps it comes down to determined individuals such as Arifagic and Kahrimanovic to show another way is possible. A society and a state based only on small group trust (rather than wider social trust) and the Bosnian notion of who is and who is not naš (ours) cannot produce the kinds of modern institutions needed to thrive in the Twenty-First Century.